Kids in my neighborhood, and seemingly every neighborhood of every friend and family member I know, are missing out on huge money making opportunities. What am I talking about? Shoveling snow. Living in a winter climate, shoveling snow used to be a lucrative business for kids. Growing up my sister and I actually asked for shovels for Christmas one year, not because we really wanted them but we really wanted the opportunity to make money using them. We used to go all around our block looking to see who needed help post snowfall. We would charge $10, $5 each, and save it all winter. There wasn’t much competition in our neighborhood since we were the oldest kids by a number of years. Given that we had the monopoly on the shoveling duties we’d make out pretty well. Friends of ours a few blocks away would get frustrated since there were ‘more boys’ and could never make money. Each storm we’d make an easy $50. Sometimes our neighbors would have the driveway done but ask us to do the walkway around the house or help shoveling off the deck so they can let their dogs out a little easier. Since my husband and I bought our house, almost five years ago, we have only ever had one kid offer to do our driveway. When he approached us as asked if he’d like help for $15 we gladly paid. It allowed us to rest and him to make some cash. He did a great job but we haven’t seen a single kid since. They exist since we see them on a daily basis playing outside, and we live within walking distance to three schools. Kids are missing out on a huge opportunity to make some money (and help their neighbors out). There is nothing I’d like more some days than to be more productive with my time than pushing snow around. There were three days of no school last week due to school/storm cancellations and not a single kid knocked on our door. Maybe I should put a sign in my window that I will pay upwards of $20 to have it done? Another lady I knew was due to have her baby any day and her husband was sailing at sea with the Navy, she posted an add via online classifieds begging someone to help with her driveway so she could get out ASAP when baby came, and it took her three days to get a response! 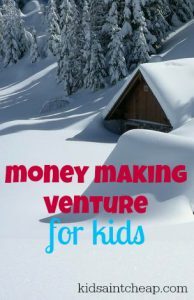 Simple tasks like shoveling snow, mowing lawns and selling treats at yard sales are a great opportunity for kids to start learning about money. How to earn it, how to manage it and all the work involved. Learning about money can never start too young and there is no better satisfaction that earning your own. Do you encourage your kids to go out and earn their own money? Would you be encouraging them to shovel if they lived in a winter climate?